In a tall container, mix the chickpea flour with a cup of water and then add the rest, this way you avoid the lump formation. Add salt and mix, and let it rest for a couple of hours. Turn the oven on at 400F, use a very wide pan, the farinata shouldn’t be thicker than 0.5cm or 1/5 of an inch, add 6 tbsp olive oil to the pan and add the mixture, mix well. Now you can put it in the oven, mid height and let it cook for 5 min, then turn the broil on and cook it for 15 more minutes. 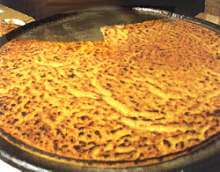 The farinata is ready when it’s golden on the surface as shown in the pic. Take it out from the oven, add some rosemary and/or black pepper and enjoy! This version makes a farinata that is very crispy on the top and soft and creamy on the bottom, if you like it harder, bake it for 10 min and then turn the broil on. Some people add some parmigiano on the top, some other pesto….to me, the simpler the better! Suggestion: to scale down remember 1 volume of flour to 3 of water. This entry was posted	on Thursday, June 23rd, 2011 at 1:18 am	and is filed under Cooking Time, English Version. You can follow any responses to this entry through the RSS 2.0 feed. You can leave a response, or trackback from your own site.